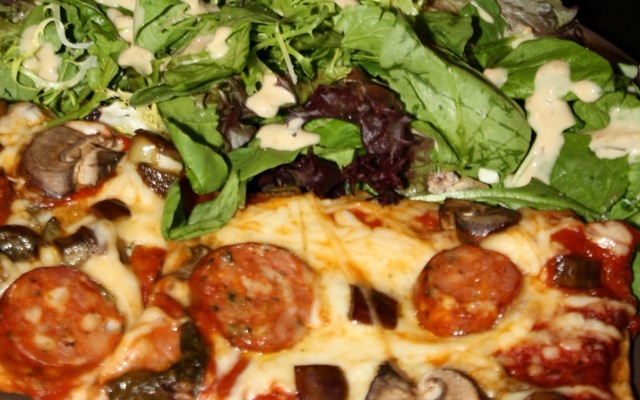 Although most people probably would not begin a post about pizza with photos of eggplant, Jill and I both view eggplant as an essential pizza topping. We were rather disappointed when our favorite local pizzaria, Decent Pizza, dropped eggplant from their menu. 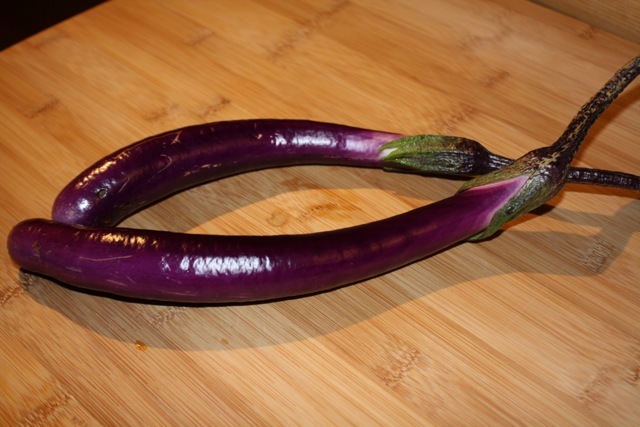 Thankfully, I had these two baby eggplants growing in the backyard garden. 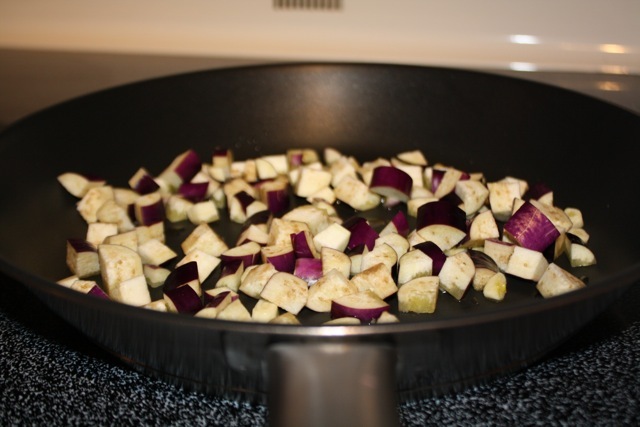 With an immediate need for the eggplants, the two baby eggplant were picked before they had a chance to grow to their full sizes (this pizza wasn’t going to sit around waiting for the eggplant to grow), diced finely, mixed with two cloves of garlic (minced) and sauteed in olive oil. 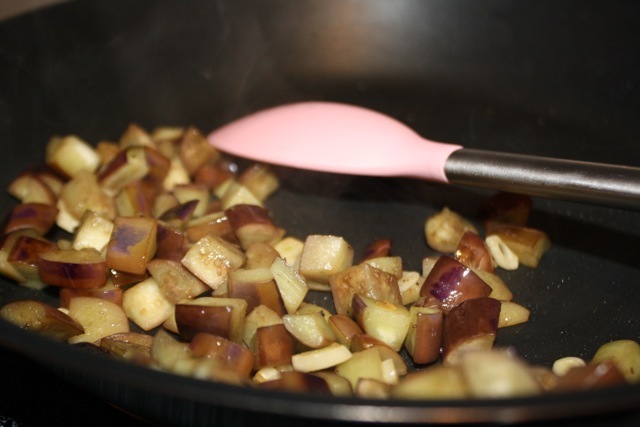 When soft, I took the baby eggplant morsels off of the heat let them await their destiny–a kind of purgatory where tender eggplant wait to ascend to the realm of deliciousness. 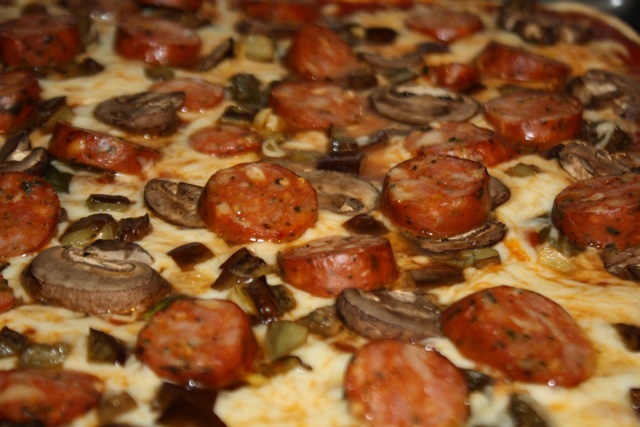 Wanting a slightly more rustic taste for the pizza, I opted for sliced Italian style chicken sausage instead of the traditional pepperoni (or the slightly less traditional turkey pepperoni). 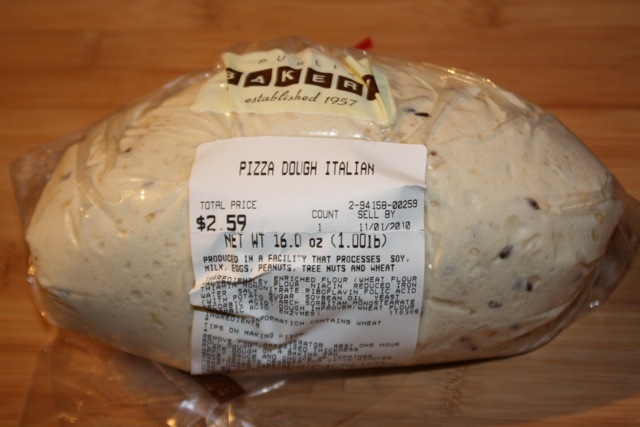 Although I enjoy making my own pizza dough, that activity is usually relegated to the weekends when I have more time. So, this Friday night masterpiece make good use of the pre-made 5 grain pizza dough from the Publix bakery. 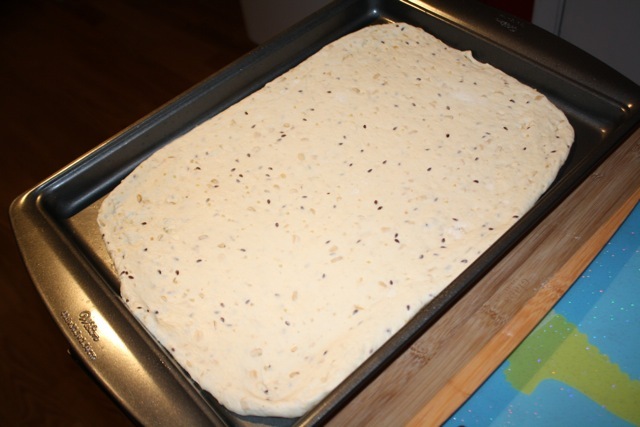 After rolling it out on a floured surface, I put the pizza dough on a baking sheet and got ready to assemble the pizza. 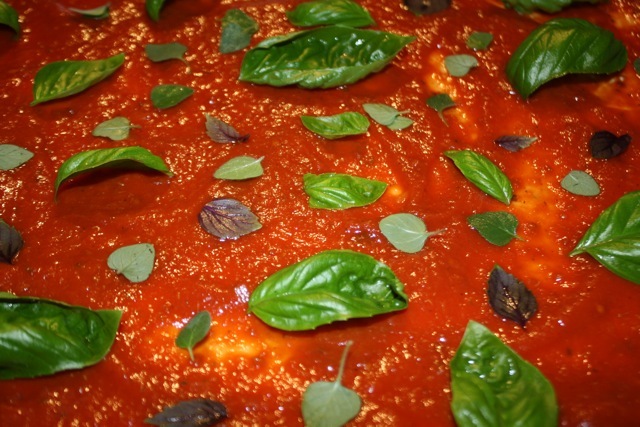 In addition to making my own dough, I occasionally like to make my own pizza sauce. Again, this is an activity typically reserved for a weekend. Tomatoes are also not currently in season. 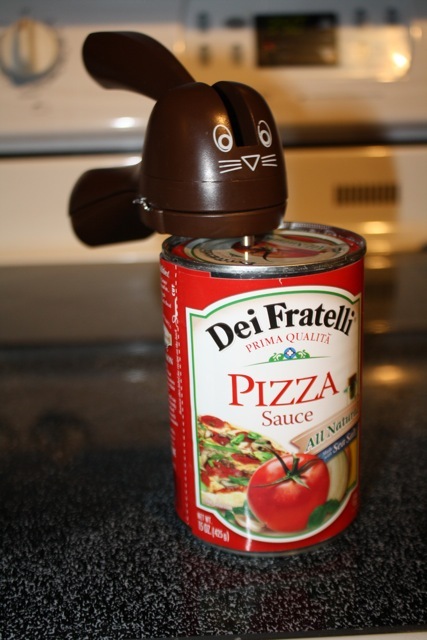 So, I used my favorite canned pizza sauce (which I opened with the ridiculously cute can opener pictured below). While tomatoes are not in season, I do have plenty of basil and oregano growing in my garden. So, I jazzed the pizza up by adding a layer of fresh sweet basil, purple basil, and oregano on top of the pizza sauce. Over the fresh herbs, I added mozzarella cheese, sliced baby portobello mushrooms, the sliced chicken sausage, and the eggplant morsels. 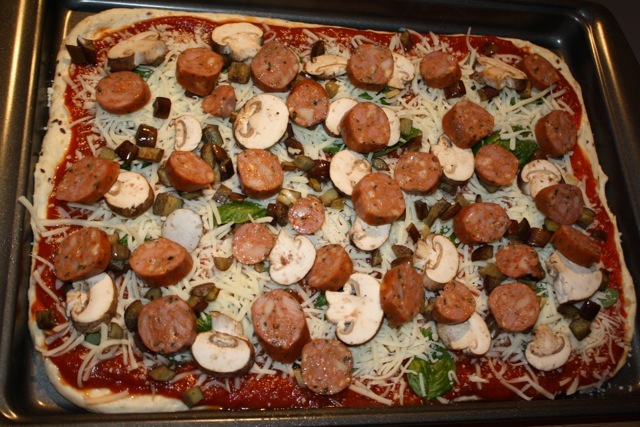 After baking for about 20 minutes at 350 degrees, the golden cheese oozed over the crust while the aroma from the mushrooms, sausage, eggplant, and herbs elicited a kind of Pavlovian response from both Jill and me. 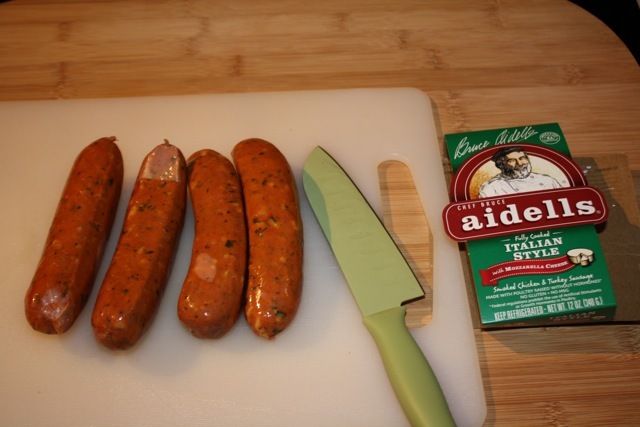 Served with a simple green salad with Annie’s goddess salad dressing, this better than take-out pizza rounded out the week with a blog worthy meal. Artie picked this from our garden this week. So fresh and vibrant. 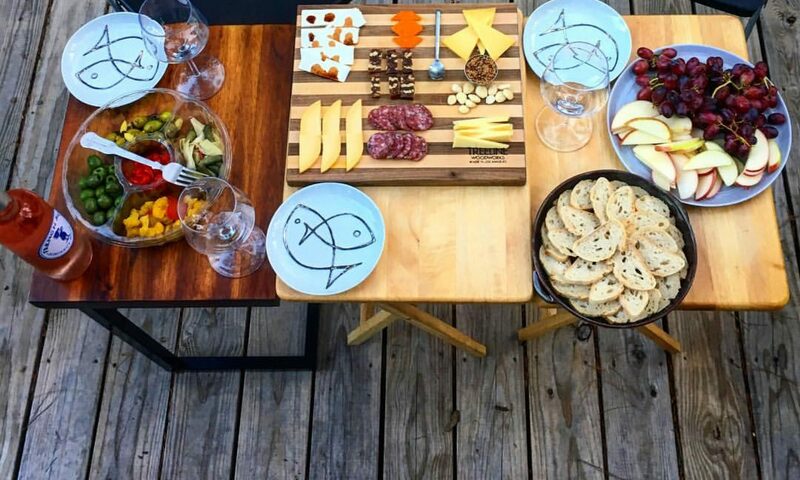 This is what it is all about – enjoying seasonal foods when they are at their peak. This basil was still warm from the hot Florida sun shining on our garden. 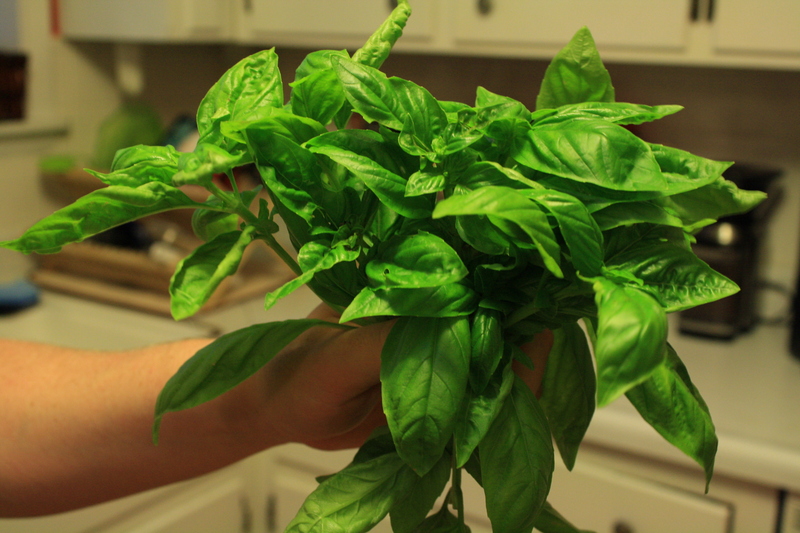 The smell of the handful of basil perfumed the kitchen with the essence of summer. Oh basil, how I love thee; let me count the ways: I love you in herb butter on ciabatta bread. I love you with tomatoes, fresh mozzarella, and a drizzle of olive oil. I love you on pizza and pasta and pretty much any Italian dish. I love you in pesto (duh!). I love you with watermelon, feta, and a sprinkle of salt (it’s good, I promise!). I love you on top of Thai eggplant, in tomato soup, and in tofu and broccoli stir fry. So many ways to love basil! In her book Animal, Vegetable, Miracle, Barbara Kingsolver talks about her frustration with her local newspaper food columnist who writes recipes for basil pesto made with “tender, young basil leaves” in December. December? In December, our basil plant will be a frosty memory and acquiring enough basil to make pesto from Publix would cost a small fortune. But, we can enjoy this delicious treat all winter long by taking a little help from the freezer. The easiest way to store fresh herbs is to wash, dry, chop, and mix with olive oil (basically make a pesto) and then freeze in ice cube trays. Once frozen, the herb cubes take up very little space and can be added to soups, stews, or pasta sauces all winter long.